Delilah has come up with more unique ideas than one can shake a stick at! What was revealed to her was a style of belly dance that involved intense Gestalt awareness. A way to being a women in a body and engaging nature through dance. The vocabulary of belly dance fit perfectly. Belly rolls and undulations met with ocean surf, body vibration harmonized with the sounds of the forest, arms twined around trees, earth oozed between toes and the dancers and musicians became more aware. She wrote a paper that has been republished in many magazines as well as read at the Orange Coast College International Belly Dance Conference in Costa Mesa, CA, 1997. Delilah performed numerous times in conjunction with Sarah Teofanov’s art installations in gallery settings in Seattle, Bellevue, University of Pullman, Hawaii, New Jersey, and the Ilkhom Theater in Taskent, Uzbekistan, 1986-1998. One of her first early innovations was the creation of the first Belly Grams (1977) for the company Live Wires in Los Angeles. Delilah convinced Joshua Leeds, the owner of a singing telegram company, to consider offering belly dance messages in addition to songs. She and a multifaceted musician, both in costumes, would arrive as a chosen location and deliver an exotic message from a distant land. The drummer had to be strong to carry Delilah into the assigned destination because Delilah danced out of a large velvet bag. The success of the original idea branched out into all sorts of performers delivering short performances as telegrams. Her innovation won her a small roll in the movie China Syndrome (1979) starring Jack Lemon, Jane Fonda and Michael Douglas. In 1985, Delilah and her husband, Steven Flynn, produced the first special belly dance instructional and performance video series, “Delilah’s Belly Dance Workshop” Volumes I, II, III and accompanying music cassettes “Tales of the Night Wind” and “Welcome to the Dance”. It was exclusively made available to women via independent special interest marketing through trade magazines and direct mail. Her series was original. With technology available to them, special interest artists no longer had to conform to previous commercial definitions of what belly dance was in the average mind; a simplistic idea that the dance was an invention to placate men. Delilah’s series did not pander to those ideas and gave women what they wanted; real McCoy belly dance moves and deeper motivations behind their dance. Delilah moved to Seattle, Washington in 1978-79, where she married Steven Flynn and had 2 daughters. Her passage into Motherhood served to deepen her understanding of the meaning and power of belly dance. During the pregnancy of her second daughter (1985) she drew inspiration to do what would come to be an iconic performance in her career, “Dance to the Great Mother”. It was a dance she toured while she was pregnant in the guise of Isis, the Great Mother Goddess. It was powerful, moving and broke cultural barriers. We rarely saw pregnant women doing anything other than waiting for the baby. Delilah dared to bare her belly and encompass what the dance was directly about; the power and beauty of life and birth. This dance was video documented by the University of Washington. A second recording of “Dance To The Great Mother” was made possible by a grant from Habibi Magazine and released publicly. It featured the dance and a interview with Delilah about the experience of belly dance during pregnancy.As the years passed, Delilah became known as the archival mother for much of the works and writing on the subject. Dancers passed on their notes to her and she wrote article in belly dance magazines inspiring insights to doctors, midwives, dancers and pregnant women. She also became the western distributor for the the documentary work of Gaby Offering from Germany. Through Visionary Dance productions, Delilah also produced over 20 fully edited documentaries of her collaborative retreat works, starting with “Dancing in the Natural World”. Delilah’s work with this part of the dance often defied descriptions. It was done in the wilds of nature and not in front of a seated audience. Thus capturing it on video tape was a must. Each followed a 10 day program where dancers pursued different themes of study with Delilah and her guest stars of performers, instructors and musicians. Many of these retreats culminated with a ritual belly dance into the ocean at sunrise which connected the primal origins of belly, birth and dance. During the years 1990-present, she personally refers to her retreats as her laboratories where she can work with dancers to explore the frontiers of belly dance. She also made documentaries of works in two California retreats with Loraine Lafata, as well as Costa Rica (tour dancing in nature), Egypt (dancing in temple sites) and Turkey (turning in Rumi’s tomb). They say an estimated 80,000 people pass through the Fremont Neighborhood of Seattle to attend the parade and faire on Summer Solstice weekend. Delilah has been a major player in the event since 1989. Her ensemble was originally called the Visionary Dancers but is presently called the Billion Belly March. 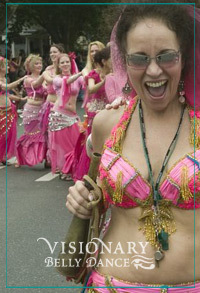 Each year they proudly dance their belly dance empowerment through the streets. The group has steadily grown and was up to 200 dancers, drummers and banner carriers in 2007; a record number of participants and totaling 20% of the entire parade. In 2008, they received a MacKay arts grant to built a 16 foot tall pyramid in the middle of the parade route made of 85 blocks. Sponsored by Fremont Arts Council. Preparations for this event usually begin in May, and Delilah’s classes and rehearsals are linked from the Studio portion of this website. This dance group prides itself on being a resource to family, friends and community as it facilitates meaningful rites of passage events in peoples lives through art, dance and leadership. They teach, mentor, perform, and create community art installations. Their ambition is to vivify the moment. Examples include seasonal dance events, dance labyrinths, community zaars, healing dances, wedding and baby showers, house blessings, wakes and memorials, women’s circles. Dancers from other cities can join the Neighborhood-Temple-Priestess Yahoo group and be a part of this fast growing movement. Parades are ancient ways of celebrating community energy and dance has always played a part. Through 20 years of experience of belly dancing in Fremont Solstice Parades, Delilah has developed a unique style in belly dance. It has arrived by the nature of a parade’s limitations. The hard surface streets makes many usual movements impossible and others have to be adapted and enlarged. The dancer has to wear shoes that change how the dancer is accustomed to moving. The audience is to the right and left and the performers are passing by. This makes the choreography much different than for a stage. The parade must keep moving always forward. Delilah has uniquely come up with a techniques of allowing for sections to pass other sections so that some dancers can display the dance more directly to the audience for short stints and still keep the parade ensemble moving forward. In addition to the Classical American Nightclub style of belly dance that she is very well known for, Delilah also pioneered and furthered a few others styles not as common. In 1976, she choreographed her first ancient Egyptian themed dance. A novel piece called “Cane Dance of the Ancient Pharaoh”. It was the featured performance each night in the Harem Caravan Revue in San Diego. Later would come her “Dance to the Great Mother“, which has been noted in many books and articles. In the 90’s she did various inspired works, one of the strongest being her “Hathor Movement Meditation”. One of two dances originally commissioned for the “Egypta” concert video project conceived by Dr. Laurel Victoria Gray and produced in Germany by Haava 1997. What separates these pieces from regular belly dance are the Ancient Egyptian costuming she designs and pharaonic style wigs she crafts. The dances employ unique stylized arm and body tableaus. They are symbolic and spiritually moving. One can feel the embodiment of the Goddess through the dance. Some dances use ritual, poetry, found sounds and symbolic props. She has researched books on the history, myth, symbolism, religion and life style of ancient Egyptians. She studies the art of the periods and delves deep into the psychic terrain. Her works are not limited to Ancient Egypt but also used goddess archetypal imagery and story telling from other ancient cultures as well; Themis, Artemis, Aphrodite, Inanna, Isis, Hippolyte, Cleopatra, Hatshepsute, and Salome. Delilah has been also involved in political theater with playwright Edward Mast in various profound projects, as well as been a featured lecture for the Art of Resistance event in 2002, 2003, 2004. They were both members of the Sister City Artists for Peace exchange to Tashkent Uzbekistan in 1989. Delilah was a guest lecturer for Seattle Women in Government, 1998 and dedicated her solstice parade ensemble of 100 dancers to Code Pink, Pink is for Peace in 2008. Delilah has been involved in various street theater performance works such as National Lysistrata in 2001. Delilah has danced for Single Payer Health Care Reform and donates her art for public awareness sometimes with the Neighborhood Temple Priestesses. Her logo for the Power Belly label is a stylized uterus and ovaries. It’s serving as a proud symbol for women’s empowerment as dancers gain strength, endurance, self confidence. The Power Belly concept has grown to encompass a number of innovations over the years. Today, Delilah’s original series is still a sought-after must-have for every dancer’s library. The original series, “Delilah’s Belly Dance Workshop I, II, III”, were shot in 1984-93 on Beta/VHS and the current medium (DVD) was fast becoming more and more refined. In 2003, her original series was taken back to the editing suite and each frame was washed and preserved in a way that not many of her contemporaries of her time took the time to do. The size and scope of the remastering project were huge, and sadly many of the great dancers from the 80-90’s video footage is being lost. Delilah’s first daughter, Laura Rose Flynn, went to school to study the medium and perform the surgery. Thus, Delilah’s legacy was preserved, and at the same time, each volume had 90 minutes of new material added to it making the series 9 hours long, including instruction, performance, documentary and even some costume and music tips. First released in the 80s, it is still an incomparable resource for belly dancers today. During the years 1991-present, Delilah began hosting study retreats in Hawaii (on Maui and the Big Island) and occasionally other locales (WA, CA, Costa Rica and Egypt). These retreats/tours have become gatherings for dancers all over the world to become closely associated. Each retreat of 8-10 days is devoted to an in-depth study of aspects of belly dance. Delilah has sponsor teachers of all different styles and perspectives to teach along side of her and join her in exploration of belly dance. Please see also see Performance Works for a comprehensive list of teaching, study and performance tours Delilah has led or been on. Since many dancers take on biblical names, this retreat explored the stories behind their names through dance. This was feminist dance work. A unique workshop using belly dance that was inspired by Gabriel Roth’s work. This was a sort of a dancing fashion show that served as an introduction to Jungian Goddess Archetypes. This was the entire theme of two 5-day dance ritual retreats. Delilah took a group of 4 dancers and 3 musicians to explore dancing with nature and recorded it. This later became footage for “Delilah & Sirocco Live & Wild!”. 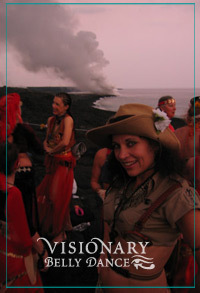 A retreat and show that featured the exploration of elemental themes and the Kilahuea Volcano. Delilah was an invited guest ’96 and featured instructor in ‘97. Dancers study Delilah’s style and approach, but she always encourages then to study with other teachers and develop their own voice in dance as well. Unlike many other teachers programs, the participants actually practice teaching belly dance. Delilah arranges for a group of non belly dancers for them to work with for 2 hours a day and then are critiqued by Delilah and the other students. This is a very valuable experience for aspiring instructors. Dancers have even returned to take the program again. Like most dancers, Delilah had to rent hourly space or teach in her house. Finally in 2004, she opened her own dance studio, VDP Studios, in the Fremont Neighborhood of Seattle WA. It took of vision. She totally gutted a building and rebuilt the insides to make it her temple that now includes a main room for classes and performance, shipping room, editing suite, show room, dressing room, basement and loft. As technology rapidly changed, the small company, Visionary Dance Productions, was always out in front keeping up. The commercial website was one of the first to provide an internet shopping cart, online video clips, sound files and a library of resource articles and photographs. They produced their programs in international formats and were some of the first to make the transition to CD and DVDs. Another innovative twist in VDP’s production history was in year 2000-01, with the production of “Absolute Beginning Belly Dance with Delilah”. She was the first to release an instructional program on the new DVD medium which allowed for more footage and easier navigation. “A Retro Choreography” was combined with “Fire at the Iao” concert performance with far reaching sophisticated DVD technology. The dancer could open the program and choose to go to the theater or the dance studio. The lesson was to learn a part of the fast paced performance choreography. Computer graphic overlays were employed along with alternative sound tracks of musicians and dancers personal commentary. It was like you could climb inside the artists head as they performed. This is a dance innovation Delilah came up with in 1989 while teaching a children’s belly dance class. Since then it has become a creative exercise, a therapy and a performance piece. She has shared this healing dance with women all over the world. It utilizes color, touch, and music to create a unique relaxing and meditative space for the recipient and serves as a sacred rite and performance exercise for the practitioners. 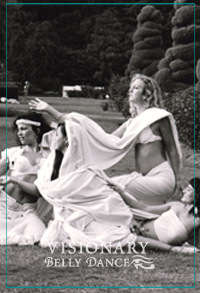 Around 1993, www.visionarydance.com was one of the first belly dance artists to go online, with the artistic genius of Steven Flynn and Fran Murphy. Delilah’s message in regards to belly dance now could reach millions of women all over the globe, and it did! It was the first belly dance site to feature video clips, sound files, merchandising, and eventually a large library of articles, events and class schedules. A second web site was launched in the late 90’s that was a collaborative effort with Delilah and two of her students Candra and Corrine. It was called www.learn-to-belly-dance.com, and featured an interesting collaborative belly dance timeline and a section called, “Instructor on Duty”. It’s a lengthy Q&A page. Her websites put her in contact with dancers all over the world and kept Delilah in touch with women’s interest and feelings about belly dance. In 2004, the Visionary Dance website was too large and thus began another overhaul, but suffered a bit from designer confusion. To reduce the size of the site, Delilah started a new web site just for her retreats and tours www.delilahs-belly-dance-retreat.com. In 2008, it became obvious that the VDP site had reached labyrinth proportions and outdated technology that needed to be brought up to speed. The goal was to update and incorporate a state of the art eStudio where dancers could study with Delilah every day and from anywhere at their desk top. It was not an easy project sorting the 1000’s of pages when they were artistic, informative, archival, and pictorial. Not to mention nostalgic. The older pages are linked under the Inspiration section of the new web site; Alexandra’s articles, the belly dance coin flip, the Under Water Belly Dance Gallery, and many artistic stories and photos about past projects. In addition to the DVDs, Delilah had another visionary idea. She enhanced the value of her DVD series with the addition of a companion written text that could be accessed online. It was a special perk to any one who purchased the programs. She called her eBooks “web clubs”, because she could change pages at any time and add new material if questions arose from her DVD student body. People who bought the DVD program are given a password to the Web Clubs. She sometimes puts up special product bargains in these pages for her alumni. Truly a unique and resourceful idea. In 2001, on the release of “Absolute Beginning Belly Dance”, Delilah introduced another powerful innovation to belly dance. Delilah had been using weight belts since she first started belly dance in the 70s to speed her physical mastery by enhancing her muscle memory, stamina and strength. She shared this fact of the therapeutic values it availed belly dancers under the name, “Power Belly”. It caught fire as she demonstrated it on “Absolutely Beginning Belly Dance”. She made this new instructional DVD for teachers as well as students. She didn’t want to copy what she or others already had out, so this video stressed the basic alignment for healthy dancing, regardless of style preference and important to belly dancing in weight belts. As she traveled around the country, she realized that many women loved and had been enjoying belly dance for years but did not understand the rudiments of basic alignment. If they really understood the basic alignment better, their dance would be clearer and traveling steps and transitions would be improved. They could have more room for individual expression. If she helped teachers understand the basics better, then belly dance could be improved across the board. The weight belts helped women access belly dance as a more aerobic workout and a tool for maintaining weight, building their strength, bone density and endurance. In became obvious she now needed to go into the business of producing and selling them. Thus the Power Belly Weight belt was born and a new department to her business. Today this is one of her most popular classes and workshops she offers. The class is not just belly dance with the belts. She has created her own unique brand of workout using the weight belts, live music, visual imagery, poetry, affirmation, aerobics, isotonic and isometric exercises. Delilah teaches teachers the ins and out of their use and they can join a Power Belly Teachers Yahoo group to stay posted about new developments. Teachers that join can get discounts on group orders of belts.